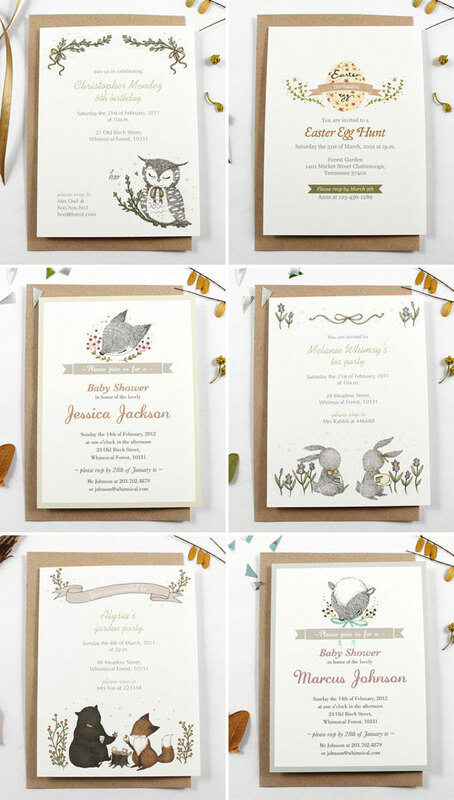 This is shaping up to be a very cute couple of days because I’ve been scoping out some seriously adorable, not to mention crushable, invitations recently and just have to share! This post contains affiliate links. 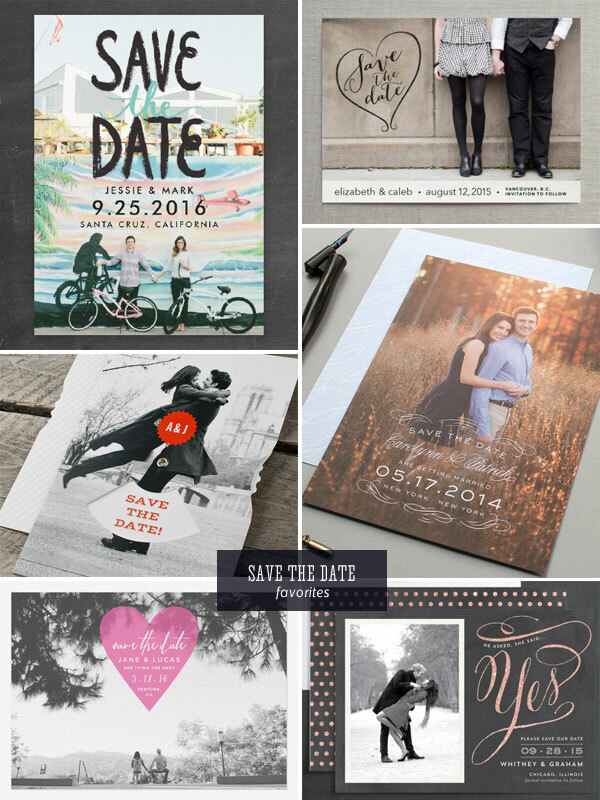 If you purchase through these links, you’ll help Invitation Crush, and you’ll receive lovely, modern photo save the date cards, too. Yay! 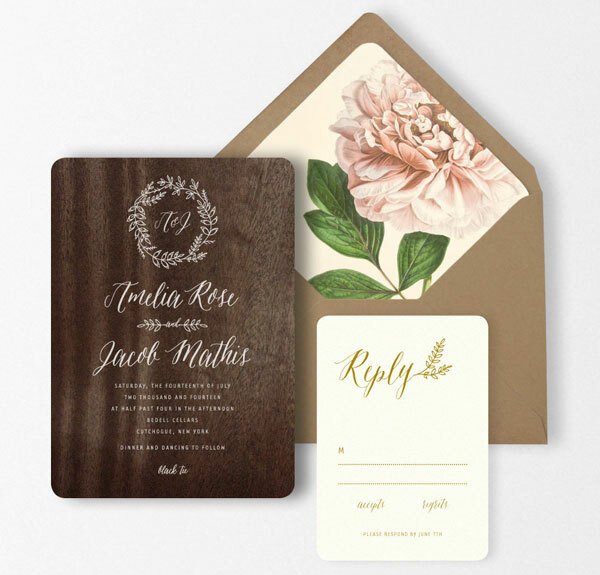 Today’s invitation crush comes to us from Oak & Orchid, whose elegant wood veneer wedding invitations pair perfectly with gorgeous, floral illustration-lined envelopes for a look that earthy, sophisticated, and so very romantic. 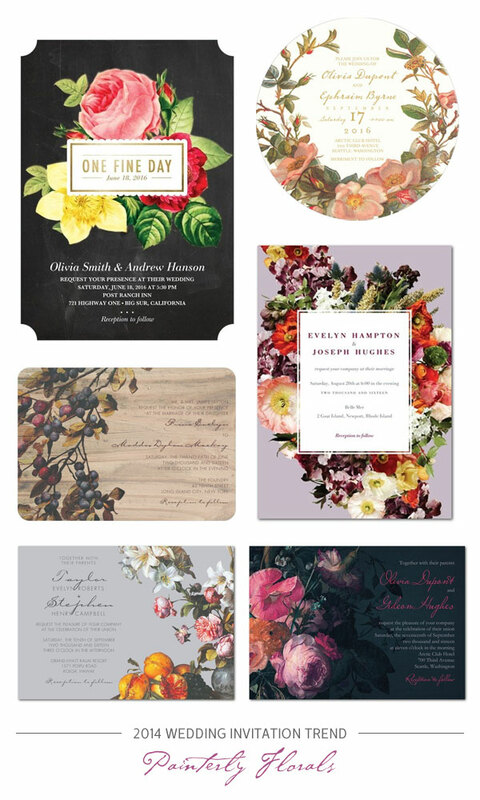 Their beautiful, floral envelope liner designs are also available as digital downloads for those of you who are going the diy route with your wedding invites. Sweet! 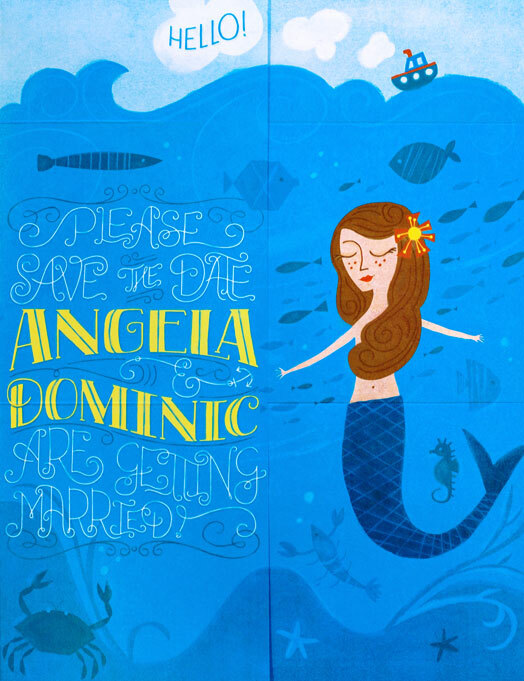 What do you get when you cross a longtime love of Disney’s The Little Mermaid with a seriously talented, about-to-be-married designer? 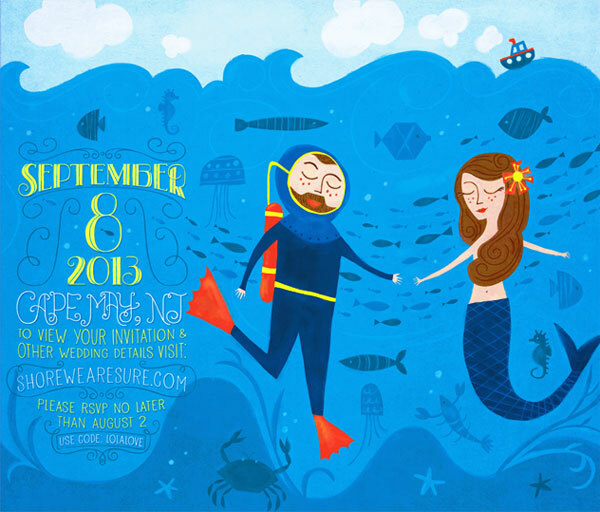 You get these awesome, nautical and mermaid-themed save the date invites by Angela Navarra, who created these darling invites for her wedding by the sea. 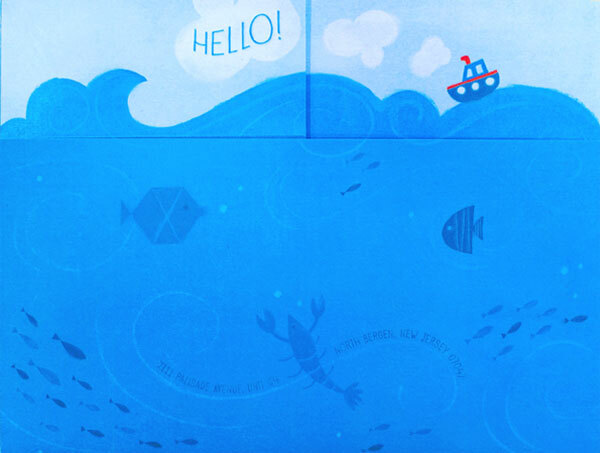 I am loving all of the little details in these fun save the date invites, from the sweet little “hello” tugboat to the “fish bubble” containing the guest’s address to all of the cute fish and crustaceans swimming in the paper sea. 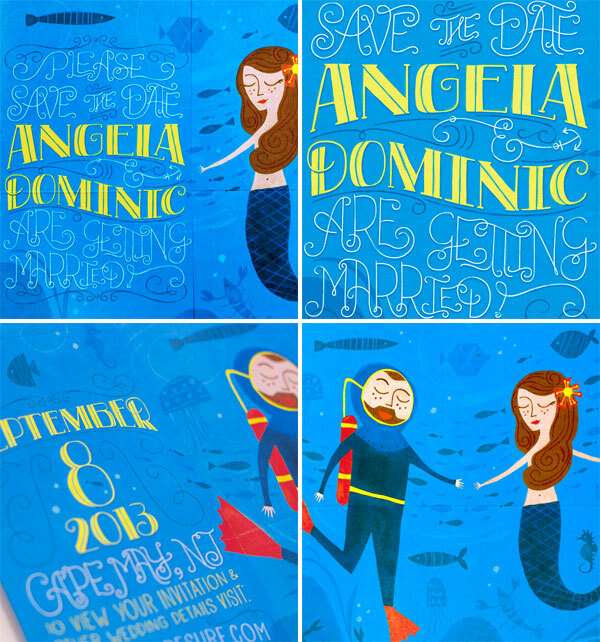 Add some super swirly, hand drawn lettering and a return address that’s being carried along the undersea current, and you have a unique and memorable invite turned keepsake for the lucky guests who received these cuties in their mailboxes. I wanted to create something that was self-contained and displayed movement, all in paper form. I gave myself a tall order to fill but, since this was for my own wedding, I had to do it! 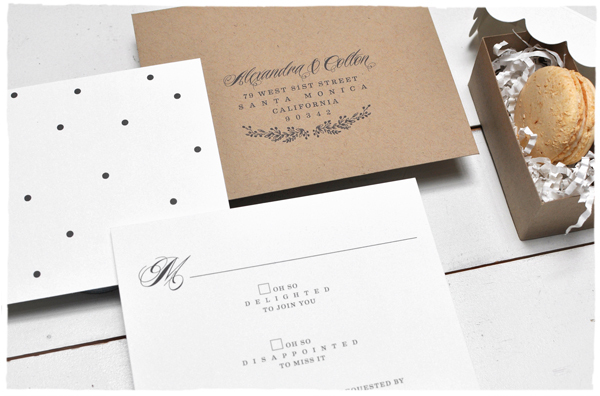 I love fold and mail stationery, which inspired this concept, and created custom typography and illustrations, which I had a blast doing. 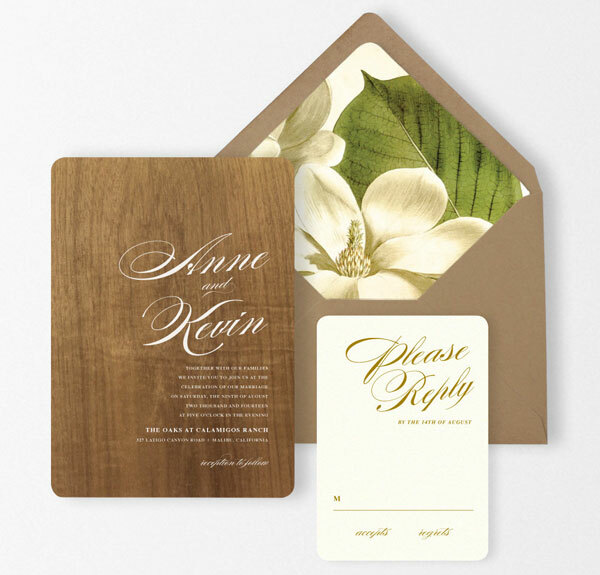 I made sure that, when a guest opened their invite, there would be a new portion revealed under each flap that would line up with what they previously saw. 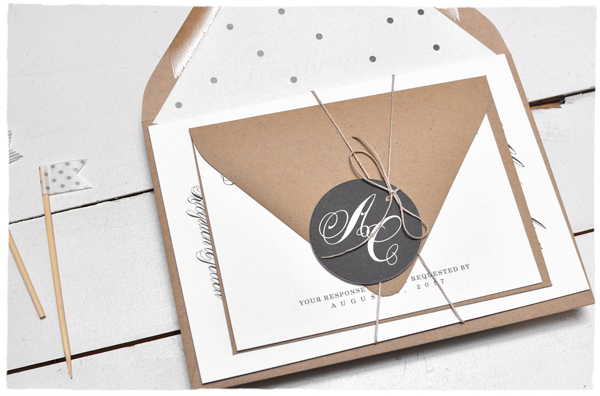 It started off as an 8.5 x 4.5 envelope that opened up to a 13 x 11 invite. 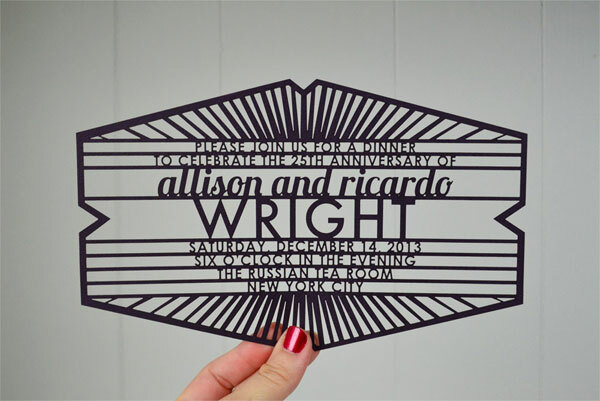 Finding a paper that would work for this concept was difficult, but Eugene and Molly from Rolling Press were super helpful and provided invaluable advice that made this invite shine. 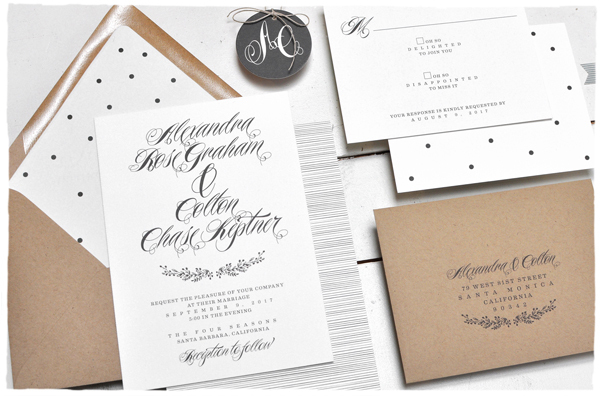 Paper Source’s 2014 wedding invitation collection shows that they have their finger on the pulse of what’s hot, hot, hot in the world of wedding stationery. 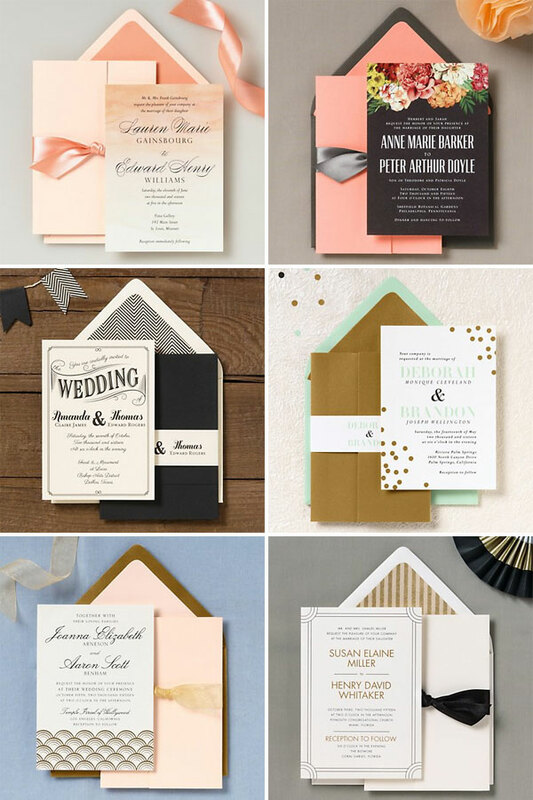 The lovely collection features on trend designs that incorporate the hottest colors (mint, coral, black, gold) and styles (Deco-inspired, painterly florals, foil stamped) around right now. 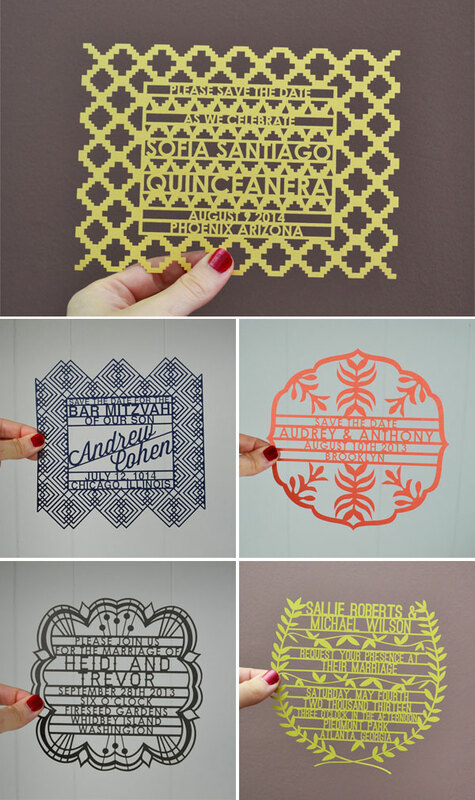 Below are a few of my favorites from the collection, and be sure to check out all of the available designs over at Paper Source. This post contains affiliate links. 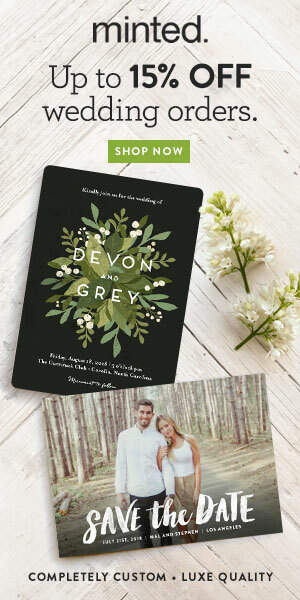 If you purchase through these links, you’ll help Invitation Crush, and you’ll receive beautiful wedding invites from Paper Source, too. Yay! 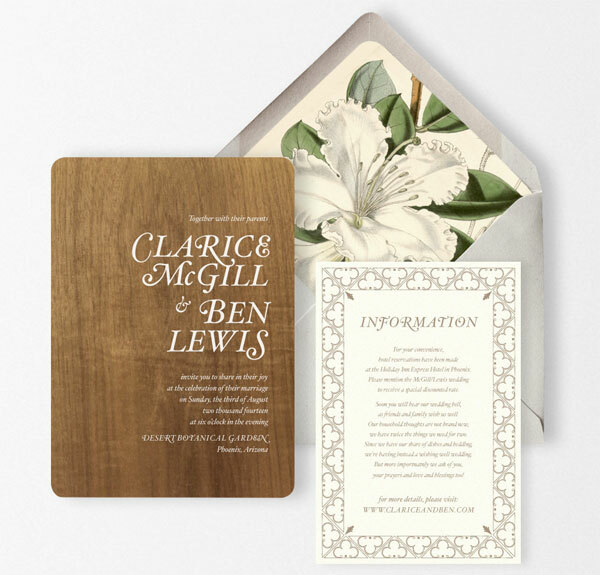 I always look forward to the launch of Bella Figura’s letterpress wedding invitation collections, and this year’s is filled with crush-worthy invites. 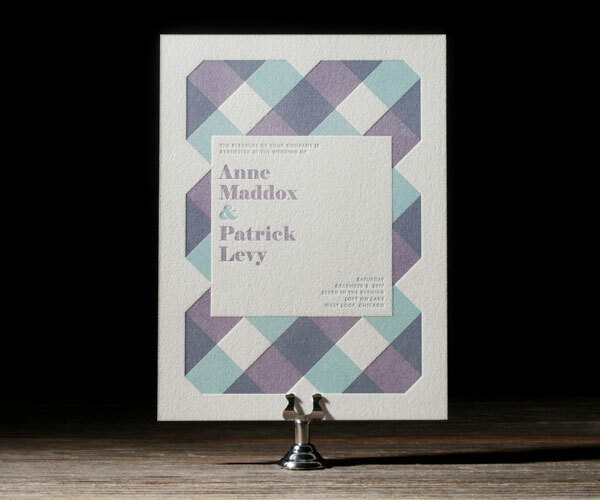 The beautiful, modern designs in the 2014 collection include the gorgeous, overprinted gingham of Clarus by Ian Koenig (above); the lovely, letterpressed botanicals of Bittersweet by Lindsy Talarico; the organic, modern lettering of Good Show by Patricia Mumau; and the minimalist, typographic beauty of Brevity by Tara Hogan. Below are several of my favorites from the new collection, and you can see all of the crushtastic designs available right here. 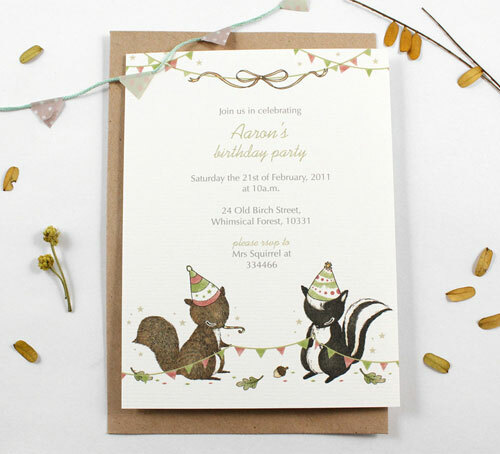 Smitten on Paper has recently been showcasing their beautiful, new wedding invitation designs, and the elegant Woodland Wreath suite instantly caught my eye. 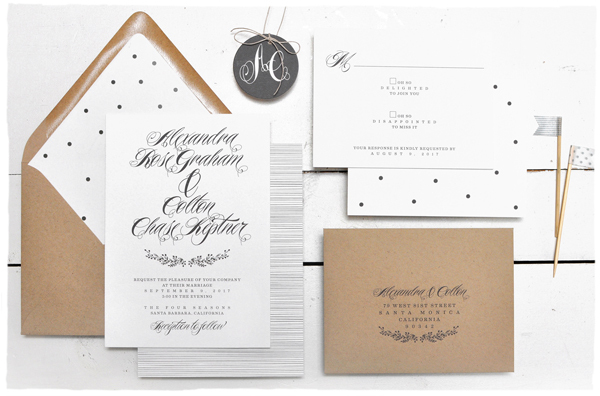 You can customize the colors to coordinate with your wedding, but I have to say that I’m really into the classic (and totally hot right now) black and white palette shown here, paired with the minimalist modern dot envelope liner and line patterned backer, and the swashy and modern calligraphy script, which gives the design an organic edge. 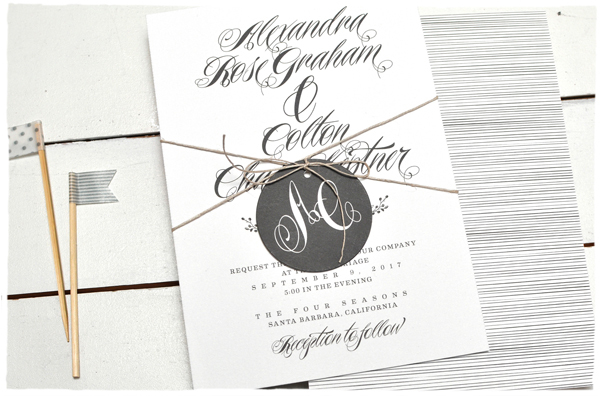 Color Me Carla’s wedding invite designs are a delightful mix of quirky, hand drawn patterns in classic black and white, as seen in The Cricket Collection above, plus hand lettered loveliness, and hand drawn illustrations + custom portraits. 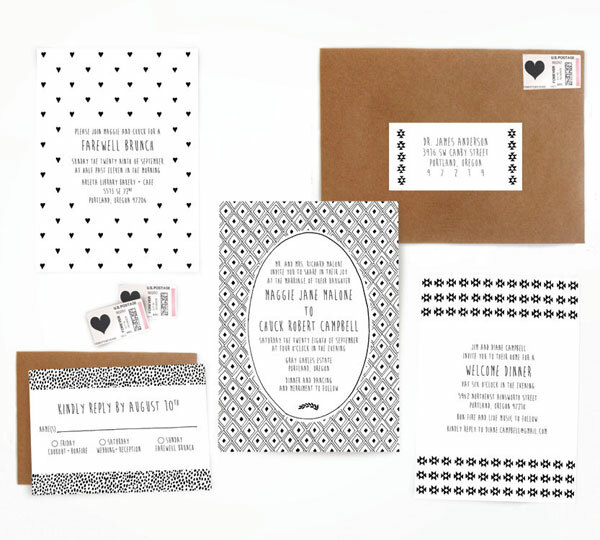 If you like quirky and sweet design, then you’ll definitely want to check out the Color Me Carla shop. 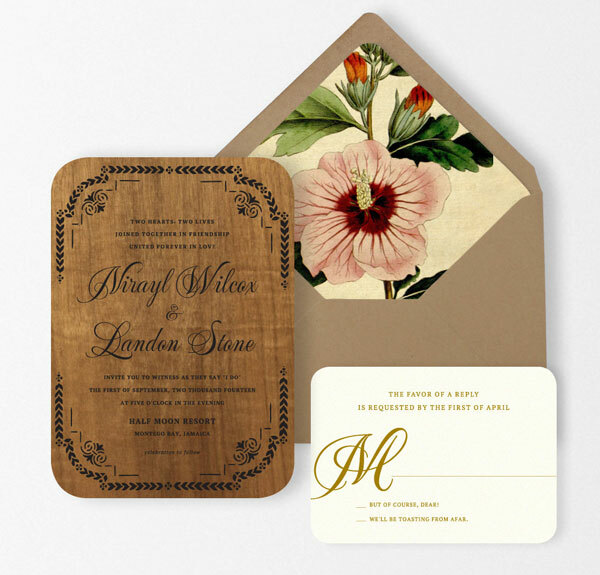 And colors are customizable, so you can coordinate your wedding stationery palette to match your colors. 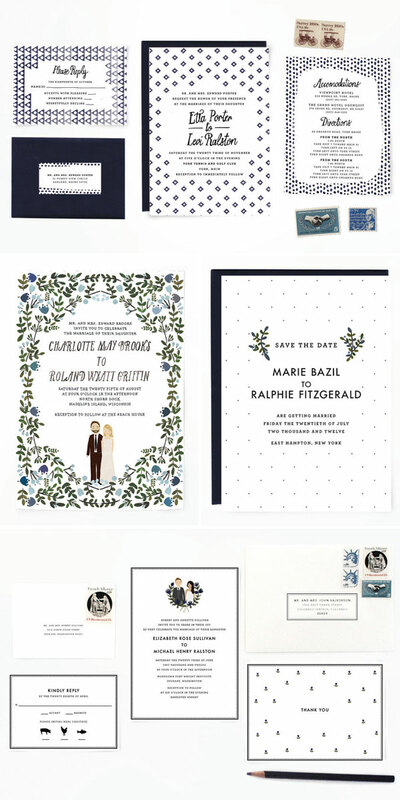 Romance is in the air this year, and Wedding Paper Divas’ 2014 wedding invitation collection showcases what has been a growing style trend, painterly florals. I’ve said before that florals never really go out of style, but it’s interesting to see how the floral style trends change from year to year. 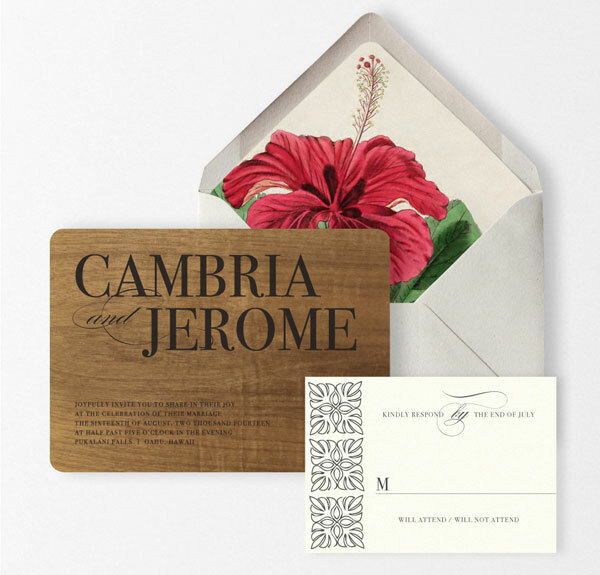 This year, designers seem to be moving away from the more stylized floral designs that have been hugely popular over the past few years and going for a more realistic look that’s evocative and romantic, with deep, rich colors and ultra elegant, understated typographic details. 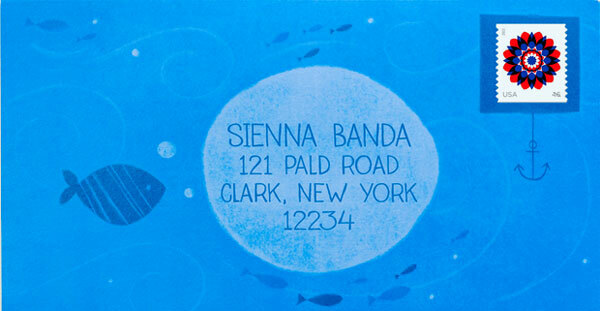 Copyright © 2010-2019 Invitation Crush. All rights reserved. Sharing is encouraged, but only for non-commercial purposes, and credit or a link back is appreciated. Please do not republish any content from this site in full without permission.